While browsing links and foraging for data, I came across an excellent pair of photos on Flickr that tie in nicely with yesterday’s post on pre-Conquest Aztec censers. Both photographs were taken by Lin Mei in 2006 at the Museo del Templo Mayor (Museum of the Grand Temple) and adjacent excavation site of the Huey Teocalli itself in Mexico City. They are hosted on Rightstream’s Flickr photostream as a part of his Templo Mayor set of images. I recommend taking a look at the full set in addition to the two I’m highlighting here, as the photos are very good quality and provide a good look at many of the fascinating examples of Mexica art and architecture uncovered by the Templo Mayor archaeology team. My thanks to Leo and Lin Mei for generously allowing their work to be shared under a Creative Commons 2.0 license. The first photo is a beautiful example of a ladle-type censer, intended to be carried in the hand and used to incense places, people, sacred images, etc. It’s the design Walter Hough described as being derived from a basic tripod incense burner design, where one leg is elongated into a handle, producing a ladle form. The second image is a picture of the large, stationary stone brazier Hough described as being used for burning incense, offerings, ritual implements and paraphernalia, and as vessels for sacred temple fires that were never allowed to go out. The popochcomitl in the photo below is beautifully preserved, and a great amount of sharp, clear detail is apparent. Look closely at the narrow waist of the hourglass shape, and you’ll see the belt-like knotted bow I discussed yesterday. It’s a much better example than the grainy turn of the century photograph available in the linked article. You’ll also notice a beautiful monolithic serpent head nestled between the two braziers. The alternating brazier – serpent – brazier pattern continues over large sections of the stepped pyramid. It’s a logical motif when one remembers that the Grand Temple, at least on the southern side where Huitzilopochtli’s sanctuary was, is a man-made replica of the Coatepetl (Snake Mountain) where Huitzilopochtli was born and defeated the jealous Southern Stars. If you’d like to read that story, you can click HERE for my retelling of that exciting narrative. I’d like to comment briefly on some of the most interesting parts of the article. I’ll start with some thoughts about the large, stationary “hourglass” type censer he mentions, which were permanent installations at the temples (depicted on page 9 of the PDF, page 112 in the original numbering). Called tlexictli, or “fire navels,” they instantly bring to mind Xiuhtecuhtli (also called Huehueteotl), the ancient Lord of Fire, who is said to dwell in the “navel” of the universe, as recorded throughout the Florentine Codex by Sahagun. Also according to Sahagun, these large braziers provided not only continual light, warmth, and a place to burn copal, but were used in the disposal of some offerings and ritual implements. 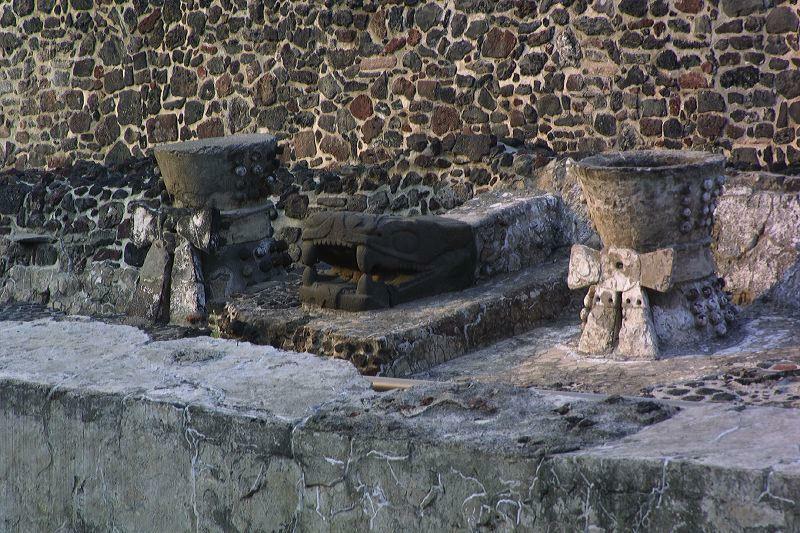 The objects to be cremated were burned in a tlexictli, and then the ashes were buried at certain holy sites on the edge of bodies of water (Hough, PDF p.11). It’s a fascinating variation on the theme of water meets fire that pervades traditional Aztec thought, here manifesting in a team effort of the two opposing forces in destroying sanctified objects that are due to leave the physical world for the spiritual realm. Staying on the subject of the tlexictli a moment longer, I’d like to call your attention to the photo on page 44 of the PDF, which shows one of the “fire navel” braziers. Around the narrow waist of the censer is a knotted bow. These bows frequently show up in Aztec art, either tied around objects that are being offered or tied around people, animals, or gods. 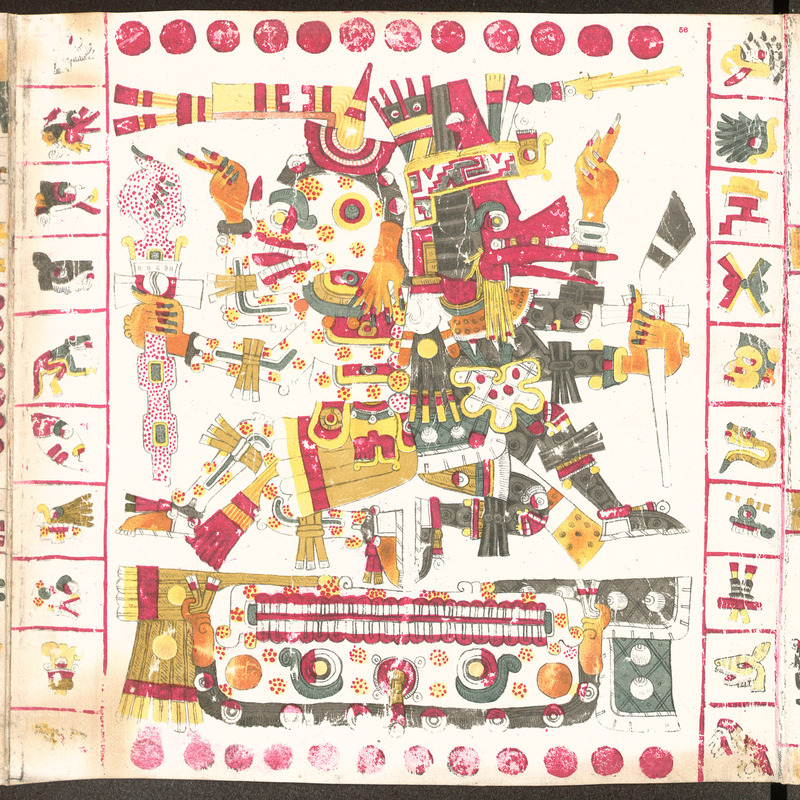 Quetzalcoatl is often shown in the codices with these bows tied around his knees and elbows, such as in plate 56 of the Codex Borgia. Mictlantecuhtli is wearing the pleated paper bows around his joints as well. To my knowledge, we don’t yet fully understand the complex meaning behind these bows, but they’re definitely associated with priestly activity and sacrifice. In that light, it seems appropriate to see these bows appear on the tlexictli. Moving on to more familiar territory, Hough’s paper covers the ladle-type censer commonly depicted in the hands of priests offering incense in the codices, as discussed in my earlier post on the subject of daily copal offerings by the clergy. In his scheme of classification, it is labeled as a type of “gesture”popochcomitl, so called because it’s intended to be held in the hand and used in various motions during ceremony to direct the sweet smoke towards its intended recipient(s). According to the author, this ladle-like shape is a signature of gesture censers among the Nahua peoples, and isn’t as prevalent among groups to the north and south of Central Mexico. This seems to be reflected in the surviving codices, as the majority of the examples I can recall offhand are that shape. I’ve seen a few examples of a bowl-shaped vessel with copal in it as well in the ancient books, which may match the small bowl-type censers he notes as being universal across Mesoamerica. Gesture censers in varying shapes were used outside of temple activities, as Sahagun notes that the duty to offer copal was shared by everyone in the Aztec empire, which Hough comments on in the household context a bit. Sahagun also recorded that copal was offered before performances of song and dance at the houses of the nobles, which presumably involved small censers that could be manipulated with a hand in at least some cases. 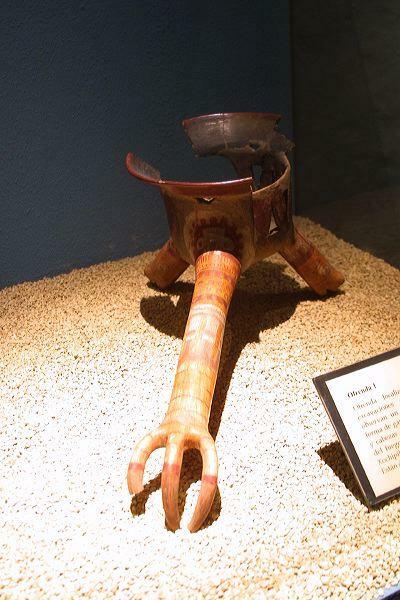 I mention that possibility because it’s a custom still widely in use today, as seen among the danza Azteca groups around the world, and one that I can show you as I wrap up today’s post. The video below is a recording of a dance for Tonatiuh, the Sun, and the dancers have several goblet-shaped censers that they use to offer copal smoke to the four directions. Once the offering is finished, they place the censers back among the other objects of the dance altar spread out on the ground, letting the copal continue to burn and smoke as they dance. Thanks go to Omeyocanze for posting this lovely video. Courtesy link to Omeyocanze’s page on YouTube for this danza video. *Apologies for not having the citations for Sahagun’s Florentine Codex in just yet, but it’s quite late and I must call it a night before getting up for work later. I’ll add them in when I get the chance soon. It’s been a while since I’ve posted an Aztec dance video, so I thought I’d share another good one I’ve found. This one is another Fire Dance (Fuego), but quite a bit different from the first one I posted back in April. This dance was performed at the 2007 Evergreen State Fair in Monroe, Washington. This version of the dance is also performed by a single danzante, a fellow who’s incredibly daring. Notice how several times during the danza he nearly crouches atop the flame! You’ll spot him carrying a small gourd rattle throughout this performance, which is a traditional instrument associated with ritual dance. Several of the gods of dance, such as Techalotl the squirrel-like Teotl, are depicted in the codices carrying rattles, and dancers impersonating these deities at festivals will wield them as well. Got an important meeting tomorrow, so I can’t write a long post at this moment, but I do have a little something cool to make up for it. I love to hunt down videos of traditional Mesoamerican dance (danza Azteca, danza Chichimeca, etc.). I found a particularly good one on YouTube not long ago, and I thought I’d share it. It’s an Aztec dance that honors Xiuhtecuhtli, the Lord of Fire. By the way, take a close look at the brazier that the lead danzante is dancing around — it’s in the shape of Huehueteotl the “Old, Old God,” the elderly guise of Xiuhtecuhtli. That’s an ancient style of making a brazier, and an appropriate choice — after all, part of Huehueteotl’s regalia is a brazier perched atop his head!